Ink Sketch Effect Plugin - Now with Source Code! By BoltBait, April 3, 2007 in Plugins - Publishing ONLY! I thought that it would be easy to automate the steps that I had come up with for turning a picture into an ink sketch. It turned out that it wasn't too hard. Rick Brewster was nice enough to send me the source code to the Pencil Sketch effect from Paint.NET 3.05. From that, I learned how to combine preexisting effects and blending operations. I'm still learning how to create complex effect filters for Paint.NET. I think this is one of my best yet. NOTE: This effect is now included in Paint.NET. If you have upgraded to Paint.NET 3.10 or greater, you do not need to download this effect... you already have it! Can you send me the source code to the new pencil sketch effect? I have a feeling that I could learn a lot from that code. If you want to wait until after release, I understand. I just want to learn how do combine effects from within an effect. You can look at the source code for Glow for another example of some effect composition. The code isn't necessarily complicated. The main problem with the effect system in Paint.NET is that effects are not easily composable. To properly compose two or more effects in a rendering pipeline of sorts, you either have to (1) allocate a full Surface object for each stage of this pipeline (or at least 1 extra surface and then flip flop between the surfaces as you progress through the pipeline), or (2) have "insider knowledge" as to which effects or adjustments can be done in-place and still be correct. 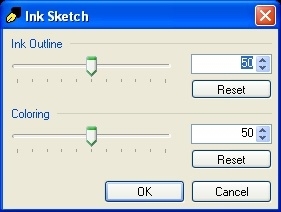 In the case of Pencil Sketch, the blur operation must be done first, after which the rest of the operations are done in-place at either the rectangle or the pixel level. Automating that will not be performant because of the memory use required. Right now if you want to chain together multiple effects you'll have to allocate multiple rendering surfaces that are the same size as the input and output surfaces. For example, effect 1 would have to render from srcArgs on to surface1, and then effect2 would have to render from surface1 to dstArgs, and then effect3 would have to render from dstArgs to surface1, etc. etc. The reason Pencil Sketch works is because Blur is executed first, and also because it is the only effect/adjustment in the action list that reads from multiple input pixels to produce a single output pixels. All the others are adjustments, which write to the same output pixel coordinate as the input pixel (adjustments are a bit misnomered in Paint.NET right now: they really should be implemented as UnaryPixelOps, not Effects with an attribute). Well, in its current state, Rick was right. I thought about it for some time and I simplified the steps to the point that it was possible. And, I did it without needing to create additional layers. 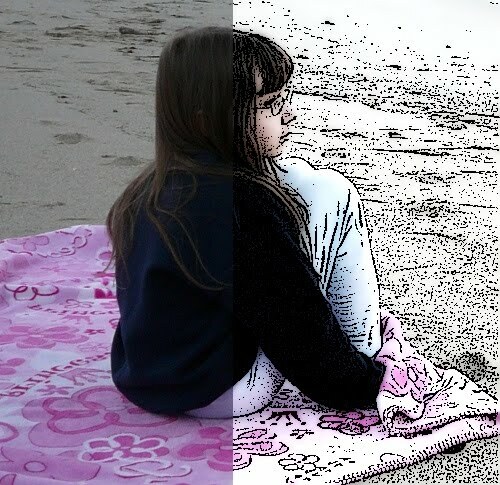 // Desc: Convert your photo into an ink sketch. No, BoltBait was the first to post. Neat! Results in a quick, neat effect which melikes. I'm learning too, so I would much appreciate to see the source, for my self learning! MadJik, I have added the Ink Sketch souce code to the first post. Thanks fo toturial! Yuo realy help me! this is a great information that made me know a lot about this tool and different tricky features. now i may better use it in multiple applications. Very nicely done...Thanks also for the tutorial..It will really help me a lot..
BoltBait, could you help me in similar task? I'm trying to implement complex effect. I need to run first effect (custom blur) on all SrcArgs.Surface pixels, put result to temporary surface and then run second effect (convolution) on it. That is similar process to this Ink Sketch plugin..
and we'll all see if we can help you. I'm sure what you want can be done, it just may not be possible in CodeLab.